Is your "home number" your "work number" too? If you are a stay-at-home parent, you know the workday never really ends. And every day brings both all-too-familiar challenges and unexpected joys. How do you keep it together--physically, mentally, emotionally and spiritually? Forty-two brief chapters cover a variety of topics and can each be read in about ten minutes. Gochnauer also includes an appendix on networking opportunities for stay-at-home parents and a helpful listing of ministries and organizations that offer parenting resources, services and conferences (all accessible on the Internet). If you are a mom or dad at home part-time or full-time, you'll find immense encouragement--plus practical advice from one who has been there (and still is!) --in Stay-at-Home Handbook. "Being a stay-at-home mom at times can be rewarding, frustrating, fulfilling, lonely and simply wonderful! Gochnauer understands its blessing and challenges firsthand, so her strategies to help other mothers succeed in this parenting path are practical, savvy and sound. If you and your family are contemplating making this move, you'll appreciate the balanced, insightful advice and handy resources Stay-at-Home Handbook provides." "Cheryl Gochnauer understands the needs of the stay-at-home mom. In this handbook you'll find the practical tips, strategies and encouragement needed to make stay-at-home mothering all it can be! It is a must for any woman committed to the profession of motherhood!" "Cheryl's expertise in maneuvering the obstacles of stay-at-home motherhood fills each page of this book. It is a must-read for any stay-at-home mom!" "Down-to-earth, user-friendly, often humorous advice to stay-at-home moms . . . plus easy-to-follow instructions for joining the ranks. 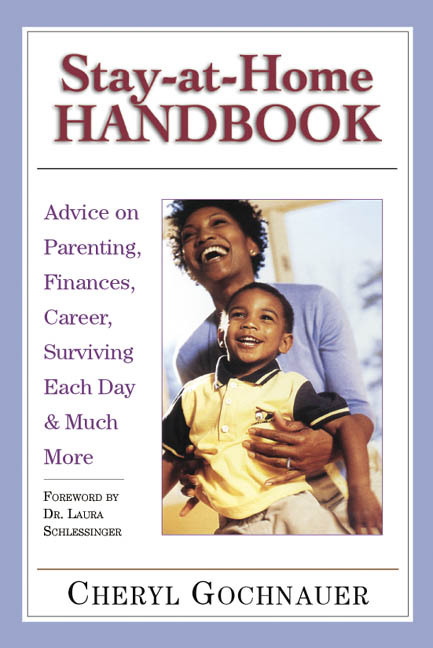 Stay-at-Home Handbook is rich with motivation, inspiration and practical how-to advice. At a time when so many families are falling apart, this affirming guide has become a welcome addition to my library and deserves a home on the nightstand of every mother who has found, or hopes to find, staying home to be as valid a career choice as any other." "I'll take homemade over store bought any day, and that includes the family as well. Cheryl gives us the tools and encouragement needed to stay focused on that which is most important: our family, our faith in Christ and the vision God has placed in our hearts for a strong family. This is a must-read for any person committed to staying home." 9. So What Do You Do? 28. Public, Private or Homeschooling? 37. Howework + Husband = Headache?